When you include the addition of the foot controller (not included) and a third party expression pedal, the HOG is a pretty costly package, but we've honestly never heard anything like it. Large range of sounds on offer. With additional foot controller and an expression pedal it makes a big footprint on your pedalboard. 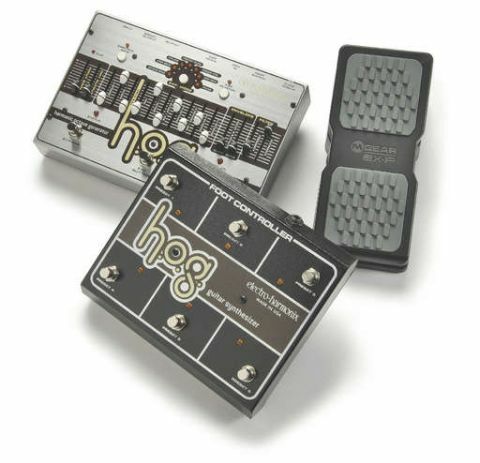 The HOG is a polyphonic octave unit from Electro-Harmonix. Along with 10 potentially simultaneous pitch intervals from -2 octaves sub bass to a canine-bothering +4 octaves, the NYC effects wizards have cranked up the aural craziness beyond that of their POG pedal (Polyphonic Octave Generator) with the addition of envelope and filter functions. An expression pedal (not included) also unlocks real-time control over octave bend, step bend, volume, wah, filter frequency, freeze gliss and freeze volume. Both freeze functions allow you to play over a held - frozen - chord or note; freeze volume allows you to bring the held note in and out at will with the expression pedal, while freeze gliss allows you to use the pedal to create a glissando between the frozen notes and those you are playing. If you're interested in creating psychedelic soundscapes or adding genuine weirdness to a band mix, you'll revel in the HOG's performance. More traditional sounding octave and pseudo-church organ effects are on the menu with virtually glitch-free tracking, but the real fun lies in breaking out an expression pedal and using it in conjunction with the freeze or filter function, or switching in the envelope to create neo-backwards effects. Be bold and make your audience sit up and take notice!